Implementation, implementation, implementation. This is what Braulio Ferreir de Souza Dias, executive secretary of the Convention on Biological Diversity (CBD), says about the agenda of the convention’s 11th conference of parties (CoP-11) in Hyderabad. In Delhi, a senior official at the environment ministry involved with the CoP preparations, translates Dias’ comment into more practical terms: money, money, money. Two years after setting 20 targets for biodiversity conservation in Japan, CoP-11 will discuss sources of finance needed for meeting them. Funding CBD has always been a highly contested issue. In an interview to CBD newsletter Square Brackets in May, Dias termed the negotiations in Hyderabad the “most difficult”. CoP-11 is the first meeting after CBD missed its targets for 2010. In CoP-9, 192 countries agreed to meet the 20 targets, called the Aichi Targets, between 2015 and 2020. Interestingly, the 20th target was to mobilise resources for implementing the others. Now, there is a mad rush to put funds in place. The challenges are pressing: there is no accurate estimate of the funds required and the sources are not specified. CoP-10 had attributed failure to meet the earlier CBD targets to lack of funds. In July, India and the UK sponsored the High-level Panel on Global Assessment of Resources for Implementing CBD targets. The panel will report its findings to CoP-11. Based on this, countries will finalise the sources of funds. The UK also commissioned United Nations Environment Programme’s (UNEP) World Conservation Monitoring Centre (WCMC) and the consulting agency ICF GHK to estimate the amount needed to meet the targets. By September, preliminary estimates for 15 targets were prepared. “In Hyderabad, we will get a sense of resources needed and hopefully agree on a mechanism to finance it,” says M F Farooqui, special secretary with the environment ministry. In the next eight years, countries will find ways to fund the targets, estimated to be between $2,060 and $4,755 billion. 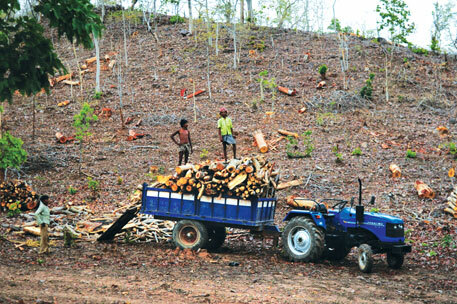 According to the environment ministry, India needs $7,417 million at business as usual level, that is, the current level of government funding. Global Environment Facility (GEF), the financial instrument for CBD, is severely short of funds. As agreed in 1992, the average annual cost of implementing CBD is $3.5 billion. But this estimate is old and the new targets are ambitious. For 2011-20, GEF is estimated to require $74-$120 billion, but it has only $27 billion. This is an almost impossible proposition for CoP-11, and it will once again witness bitter negotiations between developed and developing countries. India is pushing use of climate change adaptation funds for financing CBD targets. It also propagates its own models of institution to manage the funds. 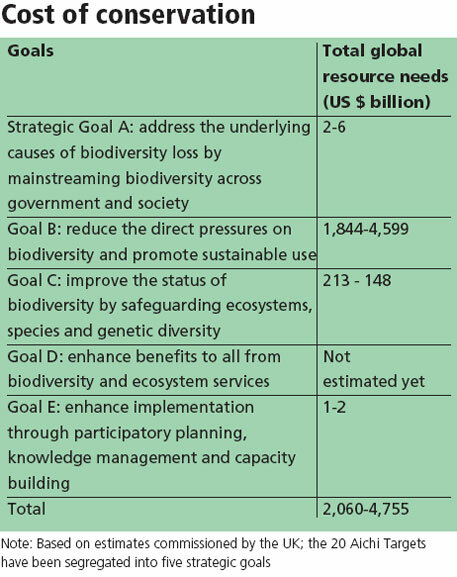 In its fourth report to CBD, India has positioned the National Biodiversity Strategy and Action Plan as the institutional template to streamline the new targets. The country’s suggestion is to develop the existing finance mechanism instead of creating new ones. It is also eyeing the National Biodiversity Fund under the National Biodiversity Act for access and benefit-sharing. Many countries favour such a fund, say environment ministry officials, as it generates dedicated domestic funds for financing the new targets.